People with disabilities are among the most adversely affected during conflict situations or when natural disasters strike. They experience higher mortality rates, have fewer available resources and less access to help, especially in refugee camps, as well as in post-disaster environments. Already subject to severe discrimination in many societies, people with disabilities are often overlooked during emergency evacuation, relief, recovery and rebuilding efforts. How can national laws, policies, and regulations provide guidance, methods and strategies to integrate and coordinate inclusive emergency management? What should people with disabilities know in order to be prepared for emergency situations? What lessons have we learned from past experiences? What are the current shortfalls (physical and cultural) that put people with disabilities at risk during emergencies and what can be done to improve these situations (e.g. through new technologies and disaster planning)? How does disability affect people’s experiences as refugees and other displaced situations; what programmes and best practices are in place to protect and promote their rights during their period of displacement? How must disabled people with disabilities be factored in to the resettlement and rebuilding process; does an opportunity for ensuring universal access exist in the rebuilding process? What is the impact of disasters and conflicts on such special populations as disabled women, disabled children, and those with intellectual disabilities? Spotlighting a pressing issue that has long been neglected in emergency planning fields, this innovative book discusses how to meet the needs of people with disabilities in crises and conflict situations. 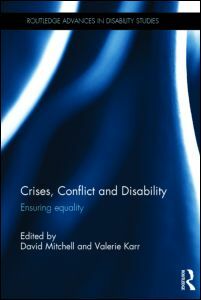 It is an important reference for all those working in or researching disability and inclusion, and emergency and disaster management, both in developed and developing countries.